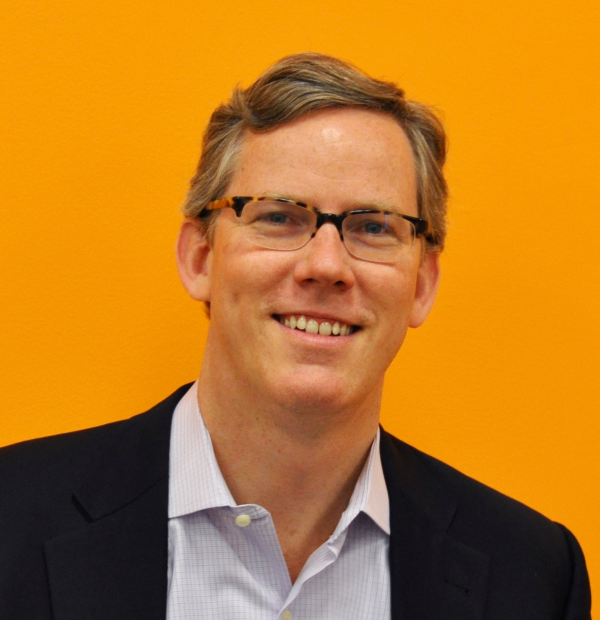 When we started HubSpot, we set out to transform the way the world does marketing. We believed then, and still believe now, that the marketing playbook is broken and that reinventing the playbook presents a great opportunity. 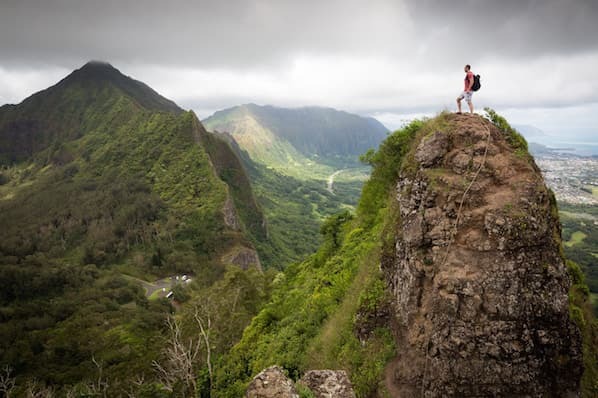 The approach that will win the hearts and minds of customers leverages content and context to create marketing that intersects with a customer’s lifestyle, needs, and interests. By helping companies replace interruptive marketing across outdated channels with a more simple, measurable, and lovable mindset and methodology, we’re helping our customers reap the benefits of the new playbook we affectionately call inbound marketing. We have big ambitions for ourselves and for our customers. We believe that we have a unique opportunity to be a once in a generation company, and that we are fundamentally transforming how marketing is done around the world. As a result, it’s important to reflect on the prior year to see how we’re doing toward making our vision a reality. 2012 was a great year for HubSpot, but it was an even better year for our customers: after twelve months of using HubSpot, 92% of customers increased their traffic, and 93% saw an increase in leads. We’re proud that our customers and partners are benefiting from the power of inbound marketing, and we’re humbled to be a part of their success. 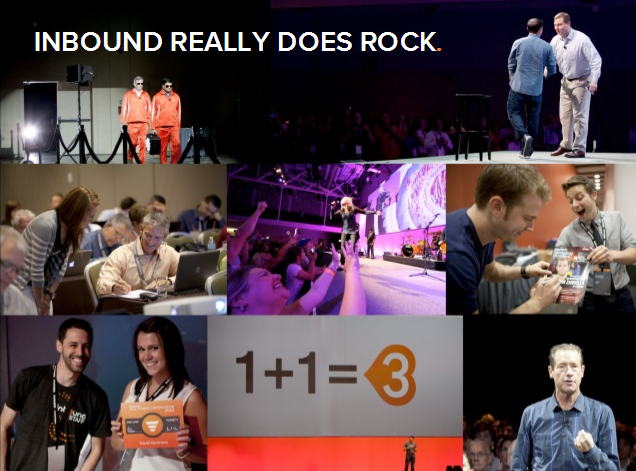 Below we have summarized what we believe were some of HubSpot’s key achievements in 2012, along with a SlideShare that delves a little deeper into the details of what we experienced last year. In 2012, the company experienced significant growth in revenue, people, and customers. But the growth that gets us excited to come to work every day is the growth our customers experience. 8,440 customers -- 2,749 of whom signed up with HubSpot in 2012 -- benefit daily from the intersection of software, services, and support our team provides. 92% of HubSpot customers saw an increase in traffic, 93% saw an increase in leads, and 38% of our customers doubled their lead flow in the first twelve months. The success of our customers and partners is truly remarkable, and we’re honored to be a part of it. Dan Moyle of AmeriFirst Home Mortgage captured inbound marketing as its core when he said: “we are much more purposeful and focused when it comes to our marketing. We now measure traffic and conversions, we test everything, and we know that traditional ‘spray and pay’ shout advertising simply doesn’t work for us.” Sonia Pelia of Thermo Fisher Scientific noted that the ease and simplicity of having all of your marketing and analytics on one platform makes her team’s life significantly easier, while Concentric Marketing in the UK quadrupled their retainer-based income as a Gold HubSpot Partner. We continue to be inspired by our customers and excited by the opportunity to make inbound marketing easier, more powerful, and more effective for thousands of companies worldwide. Another exciting milestone we marked in 2012 was our mezzanine round of financing, which brought $35 million in growth capital from a number of highly respected large institutional investors. These investors join a marquis investor team that includes Google Ventures, Salesforce, General Catalyst, Matrix, Scale, and Sequoia. We believe you’re defined by the company you keep, and we’re honored to have investment partners with all-star track records not just as investors, but also as innovators. With the most recent funding, we honed our focus on operating as a public company and hit the gas on growth. Our plans for the funds included investing aggressively in software development and product improvements, recruiting and training the world’s best inbound marketing and software talent, opening up to global markets, and generally expanding the business. Although HubSpot is a private company, we value transparency. We believe our entire community -- customers, employees, partners, investors, and fans -- benefit from knowing the problems we are tackling, the challenges we have overcome, and the opportunities we’re pursuing for continued growth. Consistent with our belief in transparency, we release our revenue numbers each year. 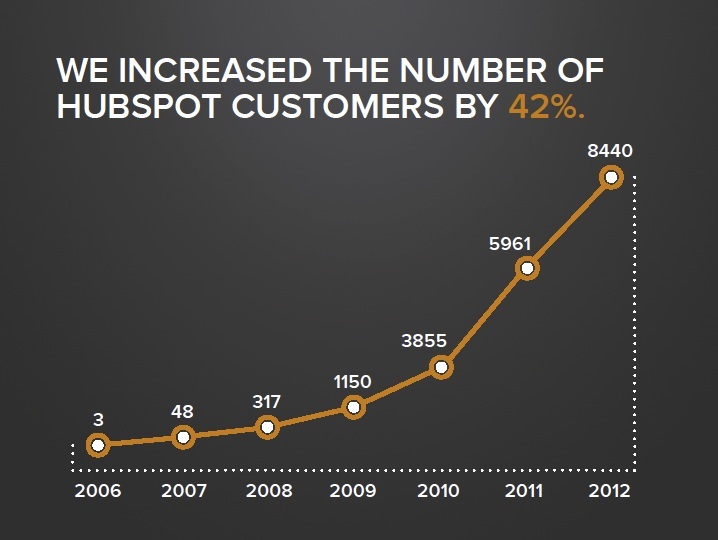 In 2012, HubSpot’s revenues grew to $52.5 million, an 82% increase over 2011. In addition to making our investors happy, this number is a wonderful indicator of the power of inbound marketing. We believe this is just the beginning, and that 2013 will continue to demonstrate significant growth globally. Speaking of global, 2012 also marked the announcement of our European headquarters in Ireland. By year’s end, we hired and trained more than a dozen Dublin-based employees and sent many of our top sales leaders and consultants to spread the love for inbound marketing in Europe and beyond. HubSpot customers are located in 56 countries, and we have 100 partners and 600 international customers already. We expect the international side to grow as a percentage of our overall business in 2013, and are excited about Dublin providing the gateway to HubSpot scaling globally. At our first annual INBOUND conference in August, we announced the launch of HubSpot 3 to the world, with 2,857 of our closest friends hearing the news in person. HubSpot 3 gives marketers all the tools they need to create a truly personalized experience for customers, including social media, blogging, landing pages, emails, and calls-to-action. We couldn’t wait to launch HubSpot 3, because we were able to give both new and existing clients the power to attract, convert, close, and delight prospects and customers in one easy-to-use tool. The value of HubSpot 3 can be summed up simply as 1 + 1 = 3: the ability to seamlessly integrate all of your marketing tools creates value well above the sum of the parts, if you were to solve for each marketing task individually. 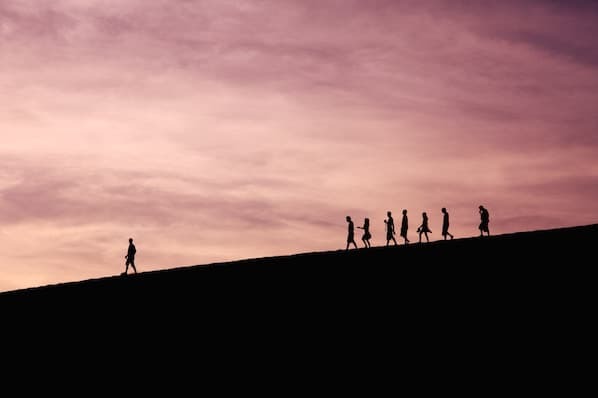 In the end, marketers benefit from the ease of use, while the end recipients of their efforts benefit from more personalized, lovable marketing. When we surveyed our customers about how they were using HubSpot 3, one of our customers noted: “HubSpot 3 has allowed us to market BIG on a small budget.” HubSpot 3 has enabled our customers to engage 46,133,635 contacts, send 555,125,987 permission-based emails, and track almost 2.5 billion page views. 49% of HubSpot 3 users reported a higher lead-to-sale conversion rate, and 20% said HubSpot directly shortens their sales cycle. HubSpot 3 combines power, ease, and results, and launching it this year was one of our biggest accomplishments. At HubSpot, we have always worked to maintain a culture where people have autonomy to solve problems that interest them, flexibility to design the work schedule that optimizes their time most effectively, and transparency to truly understand the business and vision. 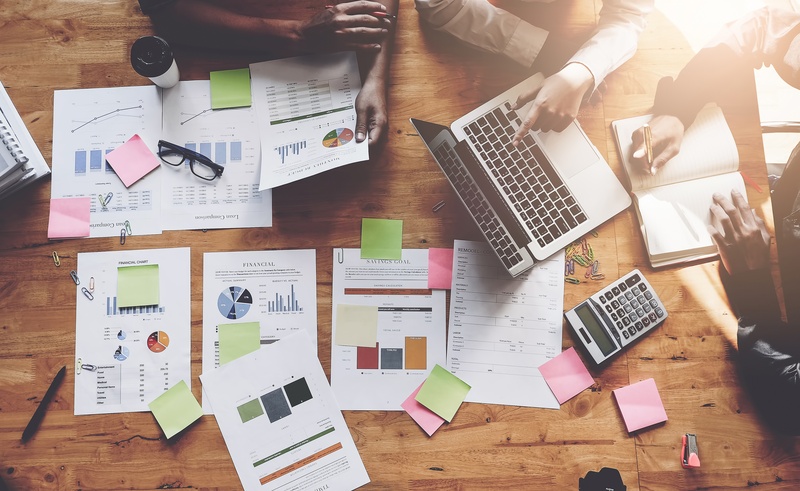 We all do what we do for the love of marketing: HubSpot employees know they are a part of the transformation that is happening in marketing and are driven to help customers and partners navigate that change. We added 125 HubSpotters in 2012, but most importantly, we did so without sacrificing the intelligence, passion, commitment, and quirkiness that has long defined our team. Sure, we added some serious bench strength in the form of seasoned executives, but we’ve also hired master content creators who helped produce 937 blog posts this year, launched a lunch roulette program to introduce new HubSpotters to company veterans, completed a CTO Swap with Kayak.com, and been recognized once again as one of Boston’s Top Places to Work. 1) Many people know that we offer free beer, but we also offer a Free (As In Beer) Books Program. Anyone in the company can request a business book, and we’ll buy it for them. HubSpot employees have requested more than 81 books from the program. The most popular items? Steve Jobs, The Challenger Sale, and Quiet: The Power of Introverts. Lately, given our growth trajectory, it’s no surprise that we’ve gotten a lot of questions about our competitors in the space -- who we view as our greatest competition, what we think of specific marketing technologies, etc. The short answer to all of those questions is that we simply do not believe anyone in our space is doing what we are doing -- delivering a truly comprehensive inbound marketing system that gives companies all the tools they need to create marketing people love. Our product solves each variable in the equation, from social media to email to analytics, while everyone else is busy helping companies solve for one component of their marketing challenges. We think, act, build, and measure differently, and we believe our customers benefit significantly from that thinking. When it comes down to it, inbound marketing isn’t a tactic, a tool, or a trend. It’s a transformative way to think about marketing, better aligning sales and marketing and creating marketing (and results) people love. Looking back at 2012, we are grateful for the HubSpot employees, customers, partners, journalists, analysts, investors, critics, competitors, and friends who made this year a huge success. We showed the world that inbound marketing is the single most powerful way to grow your business and delight your customers, and for that we are proud, grateful, and energized.